Incorporating Esri's story maps into the geography undergraduate senior seminar at the University of South Carolina helped students communicate results from their semester-long projects. The authors discuss the successes they had and the challenges they faced to help other instructors recognize the possibilities—and minimize the limitations—of using story maps in their own classrooms. The story map concept allowed students with varying levels of GIS and mapping experience (from none to substantial) to clearly express the spatial story attached to their projects. Story maps let educators introduce students to the concepts and techniques involved with creating a dynamic, geocentric web application. Story maps can be created using basic prepared templates that are designed entirely using the ArcGIS Online web application tools or from downloadable template files that can be easily configured and customized by editing a few simple HTML or comma-separated value (CSV) files. While the incorporation of story maps was an overall success, it was a learning experience with technical challenges for students, the instructor, and the technical staff supporting the class. The Storytelling Map Tour template, an interactive map and a photo panel with customizable descriptive text, was the most popular. As part of graduation requirements, geography majors at the University of South Carolina must complete a semester-long, capstone project. Students, who enroll in a seminar class during their last year in the major, enter that class with varied backgrounds in geography that typically emphasize GIScience, human, or physical geography. Consequently, students are encouraged to tackle projects that use multidisciplinary approaches. In addition, no common level of experience in mapping or the use of geospatial technologies can be assumed. The class is typically structured to partner a group of students (from a few students to the entire class) with local community agencies that have interesting spatial problems. Efforts are made to match agency work with students' expertise across major and other university coursework. Given these constraints, Esri's story maps and ArcGIS Online were chosen to enable all students to feel comfortable preparing attractive, informative maps and spatially referenced media to communicate their results and meet the objectives of their partner organization. For the fall 2012 semester, six groups of students were working on projects with three local agencies: the Gills Creek Watershed Association, Lexington County GIS, and Sustainable Midlands. Prior to the start of the semester, potential projects and how a story map or set of story maps developed as part of the class projects might be of benefit to the agencies were discussed. The agencies expressed interest in story maps as student-generated deliverables for projects. The story map format was viewed as an innovative, web-based way to help agencies explore their data, use it for internal organizational purposes, and communicate to the public about issues of interest. While all students in the class were seniors in their last year of coursework for the geography major, only about a third of them had worked with Esri's desktop or online GIS products. Most had no experience in map design. Because the class focus was on the projects and content, there was limited time to dedicate to learning geospatial technologies and cartographic practices. To get the students familiar with ArcGIS Online and story maps, one of the authors, Kevin Remington, the campus GIS coordinator, presented a lecture on the basics of ArcGIS Online. The other author, course instructor Sarah Battersby, presented two additional follow-up lectures on customizing the HTML-based templates and creating maps using the ArcGIS Online hosted templates. In total, approximately four hours of class lecture time was dedicated to introducing the basics of story mapping. Throughout the remainder of the semester, the instructor and two GIS staff members assisted students in collecting and analyzing content and preparing data to make their story maps. To aid them in building and displaying their maps, students were given department-hosted web accounts, and each student created an ArcGIS Online account. Five of the six project groups presented their project results using story maps. The group that did not create a story map used data that could not be distributed publicly due to privacy concerns from the partner agency. Four of the 19 students enrolled in the course were interviewed about their experiences with story maps. These students were from different project groups and had varied backgrounds (i.e., not all GIS-focused). Overall, their responses to the use of story maps for communicating their final project results were positive. They found story map templates easy to use, enabling them to design more exciting, interactive web-based maps than would have been possible with other technologies available to them. Students easily designed custom pop-ups with tables, photographs, and charts. The students also emphasized that ArcGIS Online and story maps were accessible to everyone in the class. While the more experienced students had an initial advantage, most students quickly grasped the concepts and discovered that they didn't need to have that background to make a great map. This allowed for greater division of labor across the groups and emphasized that mapping "isn't just for the GIScience majors." The partner agencies seemed to agree the projects were successful. 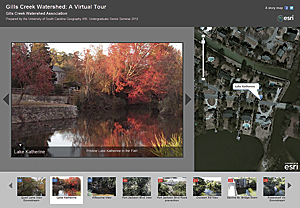 A class-developed virtual tour of the Gills Creek Watershed was posted on the Gills Creek Watershed Alliance website, and additional maps are being posted by Lexington County to show the physical, cultural, and historical landmarks of the Riverwalk, part of the Three Rivers Greenway network of trails and parks. While the students incorporated several different types of story maps into their projects, the Storytelling Map Tour template was the most popular. This template combines an interactive map, a photo panel with customizable descriptive text, and a carousel of photo thumbnails. The map template includes two different colors of map markers and is customized by simply editing the CSV file that lists the location where markers should be placed on the map that correspond to photos of each location. Additional customization of the basemap, level of zoom, and title can be done by editing a simple HTML file. The free Esri story map customizable templates and complementary hosting service using ArcGIS Online alleviate a number of instructional, IT, and administrative considerations. However, implementing these tools created some new challenges. Students could supplement story maps data they produced as part of their project with map and feature services already published by Esri and hosted on ArcGIS Online. Often, students needed datasets that were specific to the class project. These students had to create their own services. While the students' personal ArcGIS Online accounts were sufficient in many instances, projects that required working with larger datasets quickly exceeded the ArcGIS Online personal account limit for importing files of 1,000 features or 250 geocoded addresses. To work around this, large layers were broken into many smaller layers and then symbolized individually—a challenge without manual classification options in ArcGIS Online. Alternatively, access to the data was made possible via map or feature services hosted on site at the university as an ArcGIS for Server instance. While working with the story map templates and ArcGIS Online, the authors began exploring the ArcGIS Online for Organizations account that had just been provided to the university through its site license agreement. With this additional functionality, student-authored maps and feature services could be hosted on Esri's cloud. These resources then become simple for the students to consume in their story maps. While the ArcGIS Online cloud provided a number of exciting new opportunities for helping the students present more complex datasets, it also introduced some general considerations for its successful employment in an academic environment. One concern was the ArcGIS Online credits expended by the use of this cloud-based technology in the classroom. The site license agreement provided an initial allotment of credits. The authors assessed the feasibility of using institutional credits to host datasets for class projects to determine how far credits might go given expected use. Credits are generally spent for bandwidth, computation, and storage. With many class projects, the bandwidth usage cost is of little concern because the audience is often just the students in the classroom and the instructors. Of greater concern, however, is the expenditure of credits for computation and storage. Although many student-built applications consume fairly small proof-of-concept datasets, this is not always the case for class projects when partnering with state- or county-level public organizations to address problems and provide real-world applications. For these projects, a student might build an application that exposes a large number of spatially discrete geographic units such as parcel and building footprint data. In this scenario, the project would require many gigabytes of data storage in the ArcGIS Online cloud and consume a large number of credits. In one class project, a student could consume approximately 800 credits to publish and store a feature service that exposed approximately 1 GB of data. This scenario meant that, for a class of 15 to 25 students, the entire university allotment of credits could be expended in a single lab session. Of course, storing feature data in the ArcGIS Online cloud and exposing it through feature services is more costly than storing data as a tiled map service. A tiled service provides a good alternative when much of the data that a student needs to expose can be utilized as view-only data. However, even this approach can be costly if the student needs to expose large areas of high-resolution imagery and raster data that may require tiling at many different scales for optimal performance. This approach can become costly because organizations are charged credits for the computation involved in generating the tiles on ArcGIS Online and for their storage. The authors' experience indicates that using story maps requires active administration of an ArcGIS Online site. The site should be routinely cleaned to remove redundant or orphaned services and applications that are no longer needed. IT staff need to evaluate which approach (feature service or tile cache-based service) is best, in the long run, for distributing the data. Other administrative concerns include the necessity of associating each student's Esri Global Account with the university's ArcGIS Online group. While this is a fairly straightforward process, care needs to be taken when assigning rights to a group member and ensuring membership is terminated when the class ends or the student leaves the university. Even with these challenges, working with ArcGIS Online and story maps provided great opportunities to introduce students to web-based mapping and multimedia technologies. The story map concept enabled students with all levels of GIS experience to create professional-looking dynamic web map applications to support and present the research from their class projects. There were definite learning moments for everyone involved in these projects. Creativity was needed to work around the limitations of ArcGIS Online (which can't be expected to have the functionality of ArcGIS for Desktop). 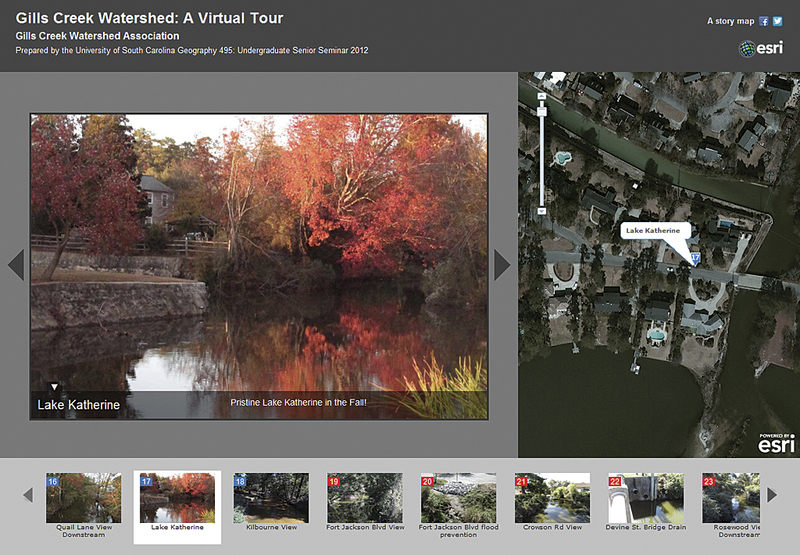 However, ArcGIS Online and story maps made high-quality mapping accessible to all students. Sarah E. Battersby, PhD, is an assistant professor in the geography department at the University of South Carolina. Her research interests include cognitive issues in GIScience and geography education. She currently serves on the board of directors for the Cartography and Geographic Information Society (CaGIS) and the University Consortium for Geographic Information Science (UCGIS). Kevin C. Remington, GISP, has been the campus GIS coordinator at the University of South Carolina for the last 15 years. His interdisciplinary role keeps him involved in many of the university's research, teaching, and outreach activities that have a GIScience component. When not immersed in the world of GIS and academia, he can be found homesteading, enjoying the outdoors, traveling, tasting craft beers, playing music, and building yurts.